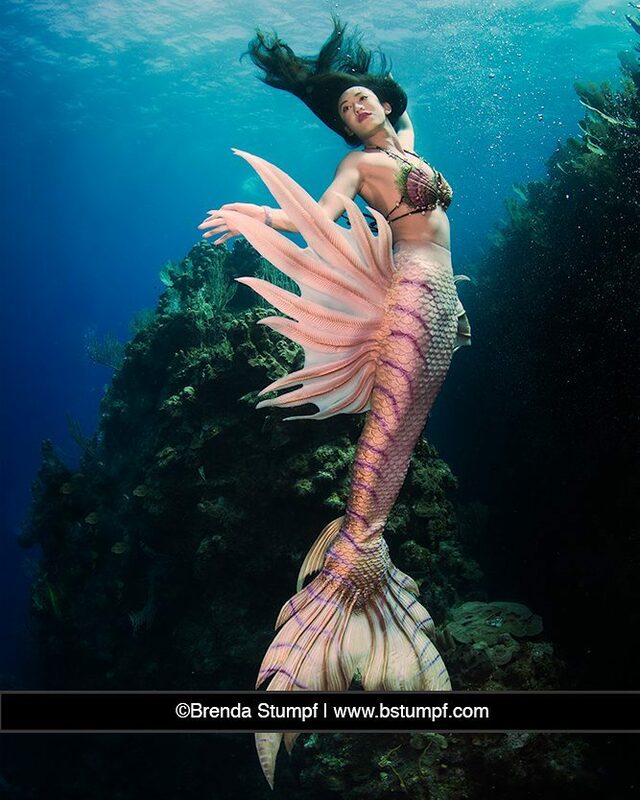 The most realistic swimming mermaids in the world from Hollywood's most stunning actresses and lifeguards…. LA’s favorite choice for the ultimate mermaid pool party experience. You've found your source for mermaids. 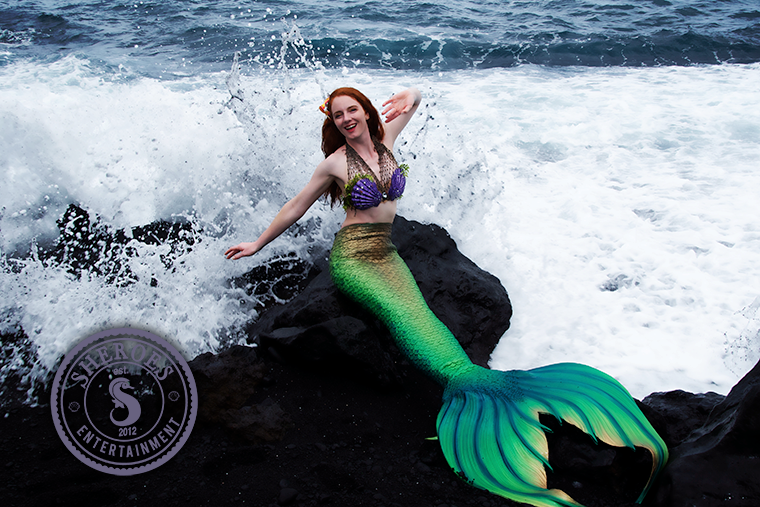 Sheroes Entertainment, LLC is internationally famous as the world's most renowned mermaid company and for good reason. Our mermaid performers are the most highly trained, our meticulously developed content is the most engaging, our water risk management and safety records are unsurpassed, and our ultra realistic film-level costumes are the prettiest that money can buy. We deliver polished, professional, and safe mermaid experiences with ingenious flair on time, every time, to every client. When you need to impress a visiting potential billionaire investor from China next to a candlelight pool, increase your aquarium gate count to unsurpassed levels, plan the most amazing birthday party EVER, figure out how to have a mermaid deliver an engagement ring to your future fiancée in the middle of the ocean, train an entire underwater mermaid film unit in a matter of days, or plan the most perfect five diamond resort kid's club summer series ever then you need to contact us. Our elite mermaid and merman entertainers have been seen at celebrity children's parties and mermaid experiences attended by people and places like Jessica Simpson, Heidi Klum, Tiffani Thiessen, Hillary Clinton, President Carter, and President Bush, and more. We also delight in serving brands and families who visit places like Ventura Harbor, Ocean Institute, the Aquarium of the Pacific, The Super Bowl, Next Top Model, TRL, MTV, CBS, ABC, KTLA, Seventeen, Les Anges, The Ellen Show, Boating Magazine, Disney, Tarte Cosmetics, L'Oreal, LA Parent, Red Tricycle, Monarch Beach Resort, Good Morning America, Vogue, and Glamour. 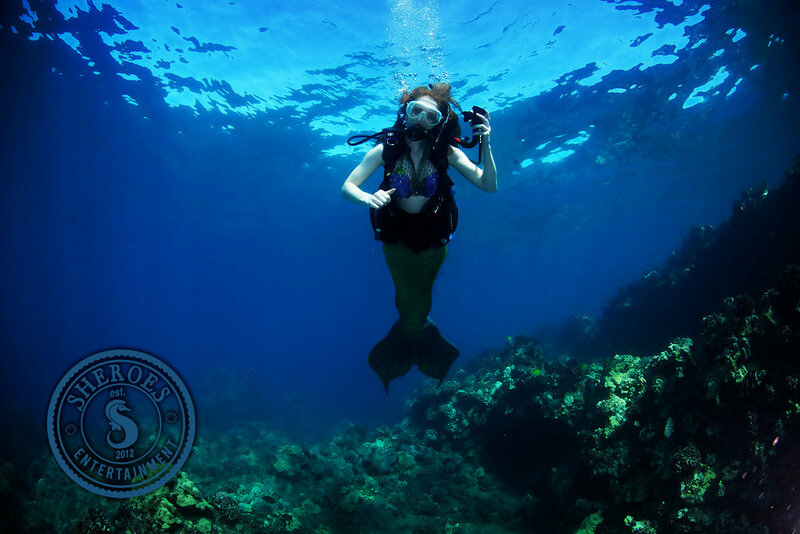 Lead Safe and Proven “Mermaid Training” and “Mermaid School” resort and hotel guest experiences for theme parks, hotels, and cruise ships. 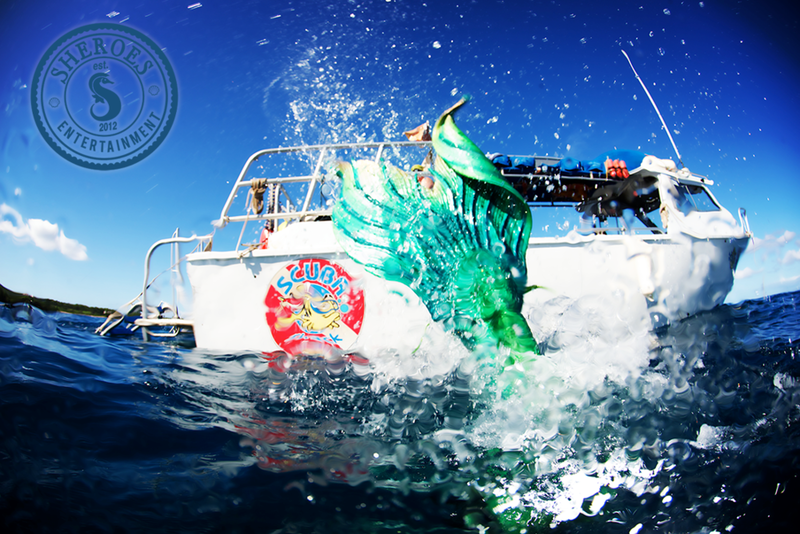 Click Here to Meet Our Mermaids! Thank you so much for being absolutely amazing and the epitome of professionalism! Everyone that interacted with you and your team was so impressed by your knowledge, eloquence, and positive attitude. The #1 rated mermaid party in the USA designed by the children's water entertainment leaders! Mini Mers, our renowned fintastic VIP (that's Very Important Pisces!) pool birthday party mermaid package, includes 1 exceptionally kind and stunning model level mermaid who spe-shell-izes in swimming and leading in water games and activities with children, the services of our expert five diamond on call party concierge staff to answer common planning questions leading up to your party (such as what to offer for food up to helping procure awesome balloon decorations), PLUS a mermazing on deck certified American Red Cross lifeguard or fantasic land character. 4 (with parent help)-16; this party can be modified for younger children as an atmosphere-only or primarily land-based interaction. This party is optimally designed for up to 20 children per each lifeguard + mermaid pair. It IS adaptable for larger groups as an atmosphere / swimming emphasis party (instead of games) or by adding on additional lifeguards, land entertainment like fairies or pirates, and/or mermaids. If most swimmers are under the age of 5, have special needs, and/or are still in flotation aids we highly recommend having having a lifeguard: child ration of 1:8. This is a turn-key, proven, swimming mermaid themed party that shell-e-brates your beloved guest of honor in a packed itinerary of activities, games, and more to fully immerse your guests in the wonders of real mermaids. If your daughter adores The Little Mermaid, Bubble Guppies is on repeat every day, your family is having a pool party, or you just love mermaids then this is the swimming mermaid party that you are looking for. After 7 years and entertaining over 100,000 kids, we have mermaid pool parties down to an absolute science where your guests' safety is artfully matched to a variety of skills-based and fin-omenally imaginative pool-based play. Female mermaids are sent by default. If you wish to have a male merman instead please tell us that at your time of booking. This experience is adaptable for hotel and resort Kids Club activities, country club member events, and cruise ship on-board children's programming experiences. We send an assistant (either character with legs or a lifeguard) with each of our finned mermaids as they require special assistance in their performance and getting to and from the pool. If your venue is a private home, condo, fitness club, or hotel where there is NOT a resident lifeguard team in a designated lifeguard office then we send a lifeguard. If you are having your party at a swim school with its own resident staff then we can swap in your choice of princess, pirate, fairy, or other human land character for the lifeguard instead. Our mermaids bring out the smiles! Pre-teens, teens, and adults' top pick! Swimming straight from Hollywood's own underwater stunt school, this mermaid party features the same high touch level of attention and mermaid training encouragement that we provide to A-listers and their friends.... delivered straight to your own home pool! 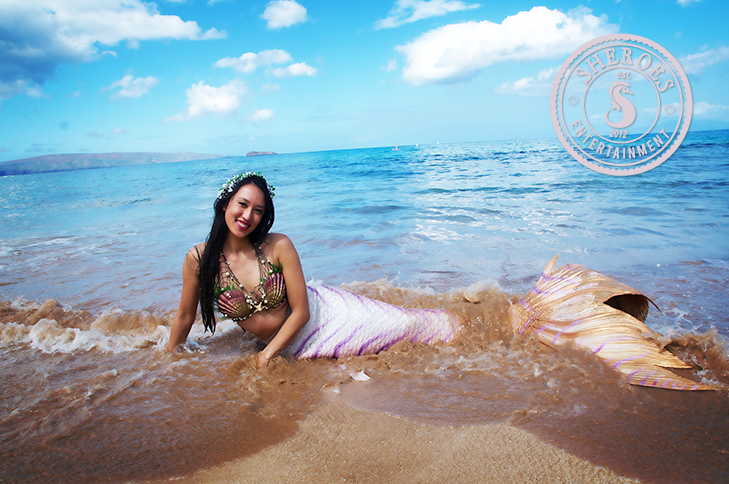 Mermaid School is a beachy blast for mermaid-loving pre-teen birthdays, adults celebrating bachelorette parties, and memorable reunions when we send a certified Mermaid Finstructor (a human who trains new mermaids - they do NOT wear a mermaid tail), and fabric mermaid rental tails for 12! This package has been featured internationally as the "go to" standard for mermaid training and has been requested by clients as far away as Egypt! 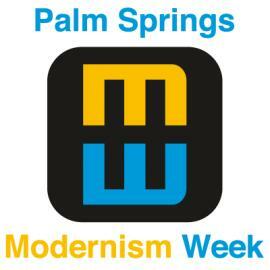 8-Adult only with a minimum weight of 90 pounds and minimum shoe size of 4 to fit costuming. We DO NOT allow this party to be sent to children's parties with children under the age of 8 attending for safety reasons. If you have a 4-6 year old please see the "Mini Mers" party package above instead as it is more suitable for them. Ability to swim 25 yards in a front crawl stroke without stopping. The ultimate California memory for family vacation photo opportunities and Scout troop beach trips! 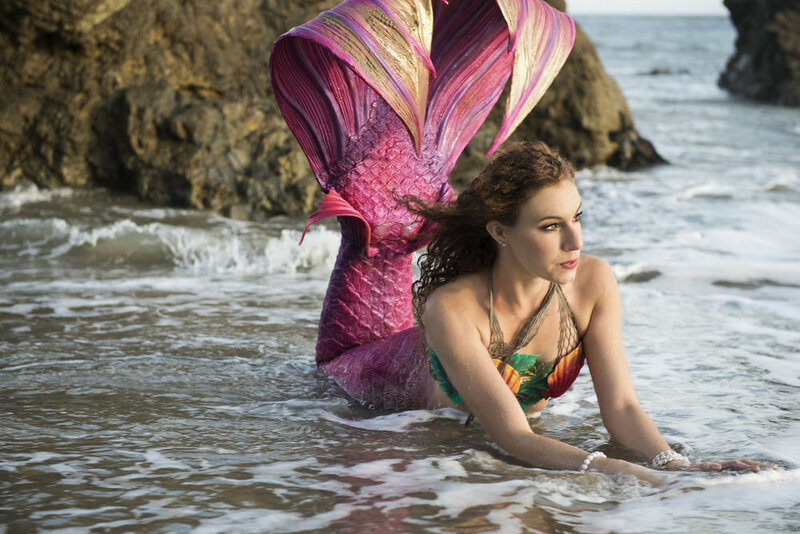 What if you were on a California vacation and met a REAL mermaid at the beach? In this spe-shell mini visit we will work with your family to pre-plan a meeting point at one of our local beaches where you will know how to "find" a mermaid at a specific date and time. Once "discovered" the fin-tastic fish friend will delight your small group with in character interactions and posing for photos with your group (guests provide their own cameras) for 20 minutes. You will then have a chance to say good-bye to the beautiful mermaid and lead your group away to finish your hike so that no one sees her transform to her human form. All. This is the ideal vacation family package. This package is land-only (e.g. not in the water) as the Pacific Ocean currents and rip tides are too strong for participants to safely enter the ocean. This surprise beach visit option is deliverable to local beach hotels and private beach clubs. For optimal sunlight on photos we highly recommend making a mermaid beach visit no later than 10:30AM in the morning and no earlier than 3PM in the afternoon as otherwise the harsh glare from the sun makes photography difficult. Per our insurance regulations our mermaids are not allowed to swim in or out of the ocean from the beach (surf zone) and cannot supervise the safety of any ocean-based swimmers or in water ocean activity. All beach visit mermaid encounters need to remain on the sand. Local beaches have parking fees; these fees need to be paid directly to the mermaid on site as they vary based on beach and are not included in your base cost. Our mermaids attract a LOT of attention in public. We recommend having your group wear a specific color or carry a balloon, flag, etc. so that we know which group to pay attention to (as compared to general curious passers by). 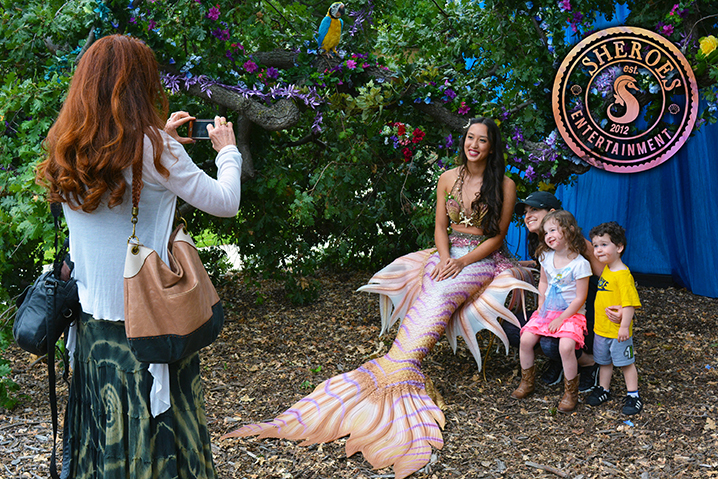 Our mermaid beach visits are so remarkable that even the LA Times had to stop and take a photo! Ahoy mermaids! Go to Neverland in this epic action-packed mermaid pool party package designed for boys and girls. Neverland features one swimming mermaid to lead in water swimming challenges, ocean education, and fin-tastic mermaid games, one land-based pirate entertainer to head up Buccaneer Bootcamp on land - a piratical training portion full of exercise, sword fighting, and agility, and one lifeguard to make sure that any plank-walking is purely done in fun. The pirate's activities on land require at least 20'x20' of cleared, flat, open space such as grass or a concrete patio. If insufficient space is provided then the pirate will need to adapt their activities to reduce the amount of physical movement-based games and activities involved to sit your space. Our pirates are both male and female and well trained to engage and direct both boys and girls. The famous mermaid princess visits your party! The fin-omenal choice for younger children. Music and mermaids - they're a whale of a good time when put together in a pool or land-based party! This song-based party experience features your favorite mermaid fairy tale, plenty of singing, and themed games selected to be perfect for the preschool crowd! This package comes with one finned-style mermaid and a lifeguard by default for any pool-based parties. If you do not have a pool then we can swap in a different character for the lifeguard, subject to character availability. If you are throwing a baby's first birthday where you need land-based entertainment, plenty of photos, and stories for small children who love cartoons and animated films then this or one of our walking-style mermaid parties is what we recommend for you. This party is optimally designed for up to 15 children per each lifeguard (or assistant) + mermaid pair. The movie-quality wig on this mermaid princess character is easily damaged when wet. As a result she can direct swimming activities while seated on deck with only her tail in the pool or when fully seated and totally dry / on land. She needs to keep her hair out of water. This spe-shell package is played by only two of our mermaids and is dispatched from either Pomona, California (played by Mermaid Prism) or Simi Valley, California (played by Mermaid Sonnet). Additional travel charges may apply based on party location for this performer. If you do NOT have a pool and kids will not be swimming we can substitute a different character in (such as a fairy or generic princess or girl pirate) for the lifeguard on this package. A mermaid themed show designed for preschools, summer camps, and schools! 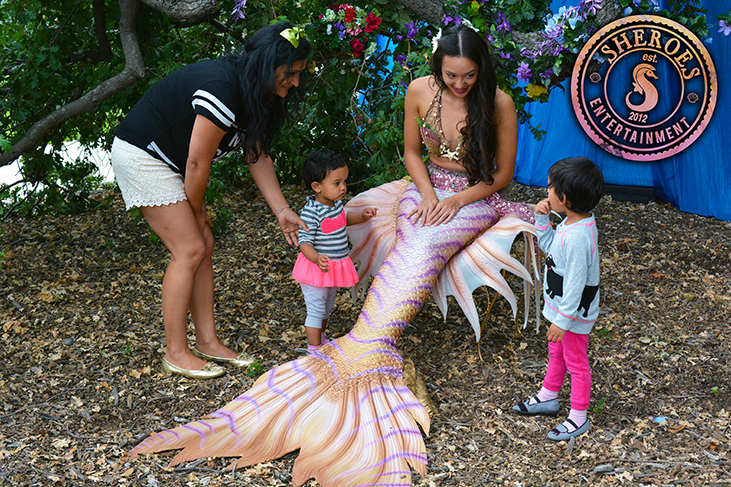 This 45 minute mermaid show is optimally designed for LARGE crowds where you need to move multiple audience groups quickly through a space while offering a whimsical mermaid experience and tying it to ocean education. Our mermaid friend brings some of her favorite tidepool animals (fake, able to be out of water) to teach about the tidepools, ocean animal adaptations, and interesting sea animal super powers! Along the way your audience will be able to participate and share their love of the ocean through lively discussion, sharing, and a special sea animal seated song. 4-10; ages 3 welcome with active teacher or parent assistance. This stage-style show can reach 200 children at a time with an adequate sound system and parent or teacher / camp counselor help. It is ideal for library summer reading programs, YMCA day camps, Girl Scout badge days, and school assemblies. This is a non-swimming show due to microphone and sound level requirements. This mermaid stage show can be tied to school and state educational standards. This mermaid show is perfect for library summer reading events - we have a variety of sea animal books to feature with storytelling-specialty performers. This package is highly modifiable based on budget with both included set and non-set options and three different costuming levels (walking skirt, fabric fin, and silicone fin) for maximum budget flexibility. Mermaids at Sheroes Entertainment face the mermaid entertainment industry's most rigorous hiring and training standards with only 1 out of every 400-600 applicants succeeding in becoming one of our fin-omenal professional mermaids under our extremely rigorous quality and hospitality standards for FIVE MONTHS before being eligible for any party work. Fully Insured - Both for Worker's Compensation AND General Liability; The Only Mermaid Party Company in the Western USA To Operate Legally With This! Guaranteed to show up or you don't pay! A private pool rental + lifeguards + mermaid entertainment! Life is better for mermaid parties in West LA with Lenny K & Sheroes! CLICK HERE to learn about pool rentals. What? Did you just see that? Adult: What was your favorite part of the Party? 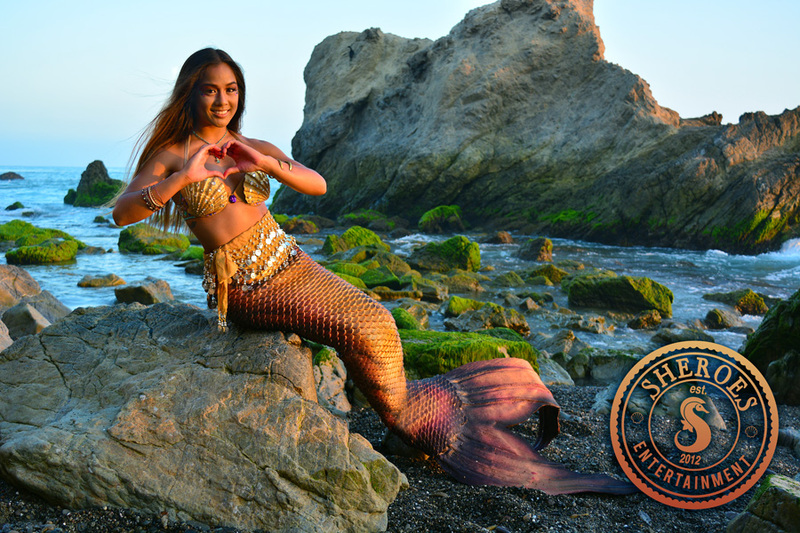 Our professional mermaids are available internationally and are particularly seen in Southern California including Orange County, Los Angeles (inc. Hollywood, Pasadena, Glendale, Burbank, Porter Ranch, Northridge, Culver City, Woodland Hills, West Hills, Granada Hills, San Fernando Valley, Valley Village, Sepulveda, Mulholland, Coldwater Canyon, Encino, Hidden Hills, Hidden Valley, Universal City, Citywalk, Brentwood, USC, UCLA, CSUN, La Canada Flintridge, Monrovia, Arcadia, Topanga, Century City, Pasadena, Silverlake, North Hollywood, West Hollywood, Bel Aire, Beverly Hills, Calabasas, Agoura Hills), Ventura County(inc. Moorpark, Simi Valley, Camarillo, Thousand Oaks, Ojai, Newbury Park, Westlake Village, Lost Hills, Lake Sherwood, Oak Park, Ventura, Oxnard, Port Hueneme, Point Mugu, Fillmore, Piru, Saticoy, Conejo Valley), Sacramento and surrounding Northern California areas including Napa, Sonoma, Elk Grove, Cameron Park, and more.